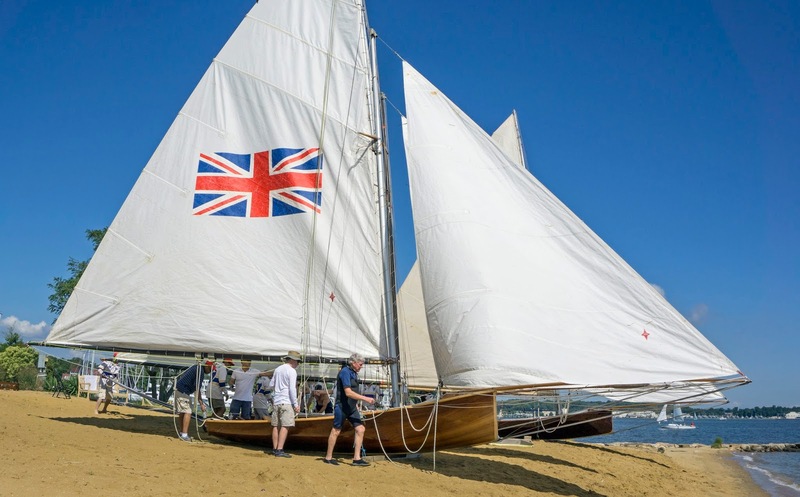 The three reproduction Australian 18-footers that made the trip to Annapolis represent the design evolution of the 18-footers from pre-war WWII to post-war WWII. Following are photos of the transom shapes of Aberdare (1932), Alruth (1943), and Australia IV (1946). 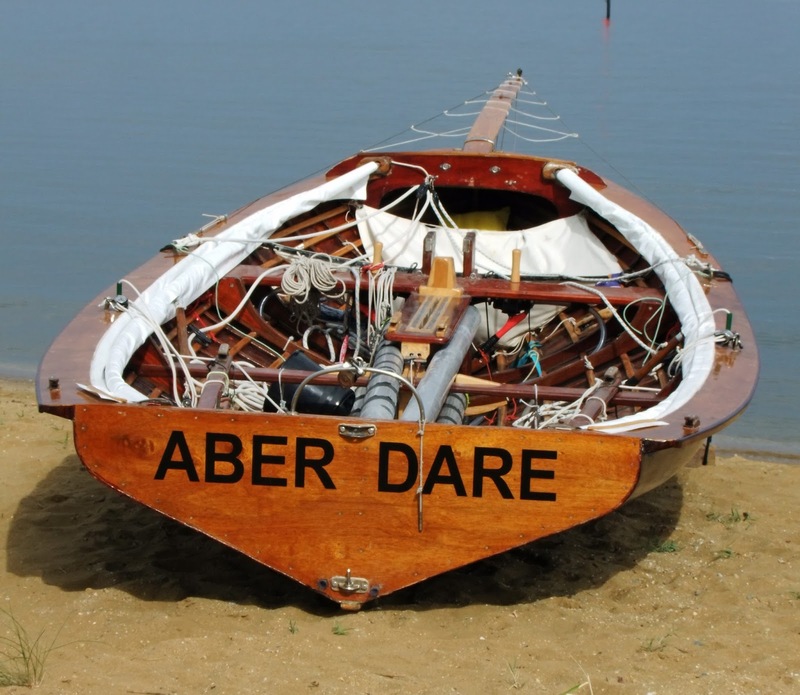 Aberdare was one of the early ones to straighten out the hollow garboards of the wineglass transoms typical of the 18-footers at the beginning of the 20th century. 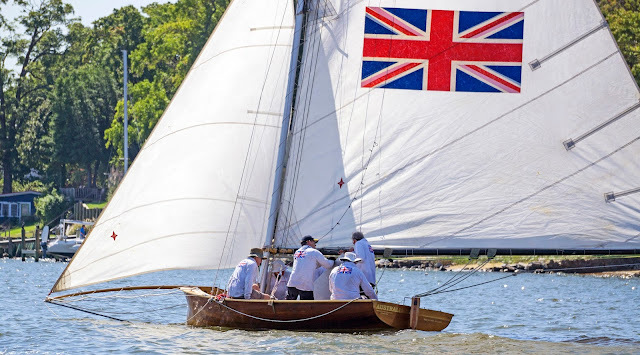 She still sports a very fine transom compared to the fat, flat ones of the modern skiffs. Alruth started flattening the transom shape (though still very Vee'd). Note the raised lee-cloth which are raised most anytime the historical 18's are afloat to keep the briny sea from swamping these beasts. 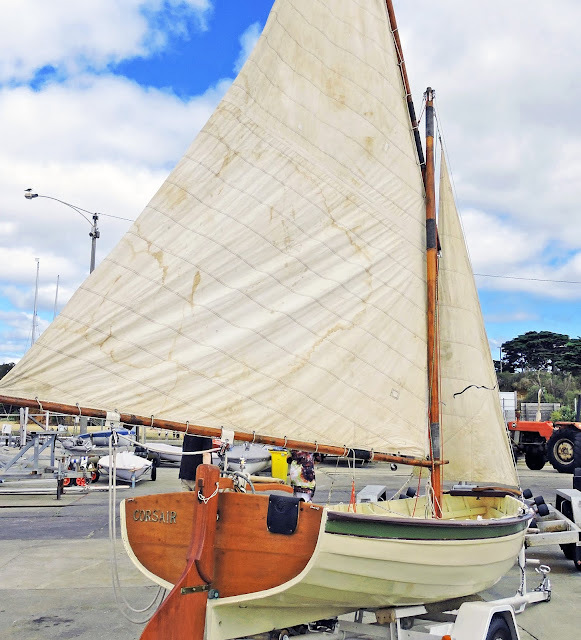 Australia IV has a transom shape similar to a typical pre-war Uffa Fox International 14 though the shapes were developed independently. In what seems a reversal of modern sailing design theory, the very fine-transomed Abedare is currently the fastest of the historical 18's, though many knowledgeable observers credit this to a very accomplished crew of Abedare, led by John "Woodie" Winning. When the Aussie Historical 18-footers came to Annapolis, Bob Ames also shot the following two videos (as well as the photos from the previous post) of the 18's on Bembe Beach. 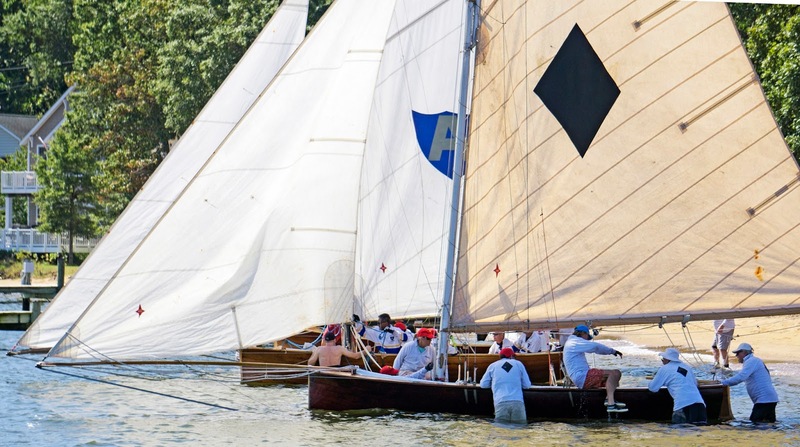 As mentioned in a previous post, three Australian Historical 18-footers were in Annapolis this past week to race against each other as well as the National Sailing Hall of Fame's two sandbaggers. 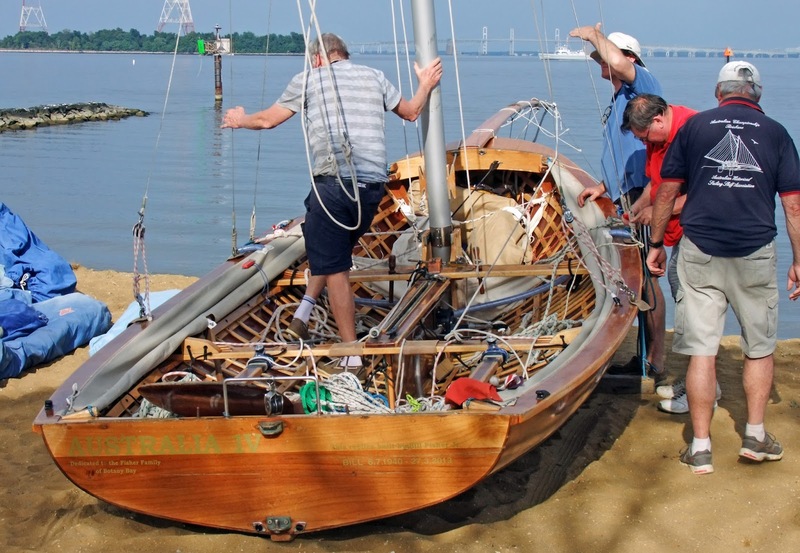 The 18-footers launched off of Bembe Beach, hosted through the courtesy of the Annapolis Sailing School. 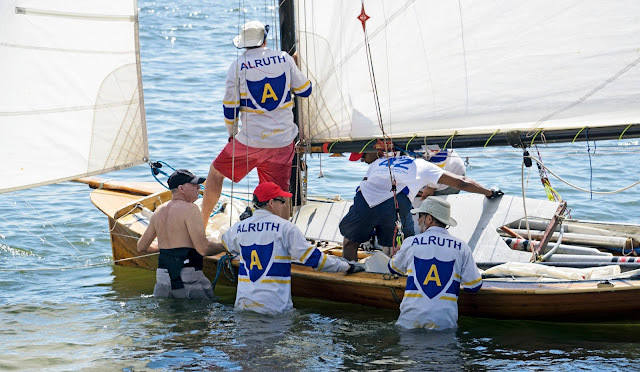 Bob Ames got to be one of the guest crew for one of the race days and sends along these photos he took of the three 18-footers rigging and launching from Bembe Beach. The previous header photo was of the Australian 49'er I plucked from the Internet, hence the location is unknown, but, if I had to guess, I would say this is a screen shot from the famous/infamous medal race at the 2008 Quingdao Olympics. Nope, I'm not posting about the Jack Holt designed, 3.2 meter, 10.5 foot junior dinghy, popular internationally. This is the Australian 12-foot Cadet, a lapstrake open dinghy, designed in the 1920's and still used as a junior trainer by the Royal Brighton Yacht Club in Melbourne, Australia. The 12-foot Cadet, definitely an anachronism in this modern age, is still used by the RBYC and seems very much at home in the big wind and big water of Port Phillip Bay. A vintage restored Cadet Dinghy. 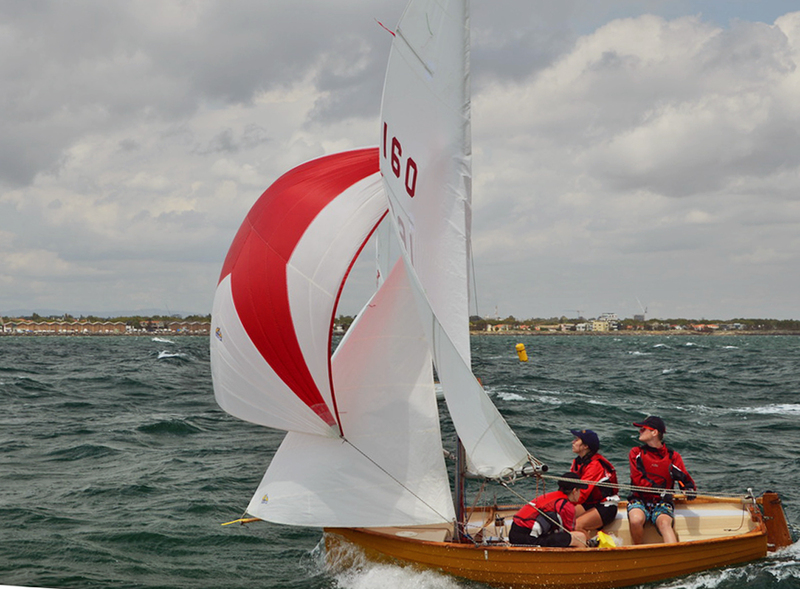 Sporting a skeg and gently swooping sheer, you couldn't get any more classic lines for an old traditional dinghy, . Big winds, big waves, spinnaker pulling. The juniors sail them three up and the modern ones are fiberglass with aluminum masts. 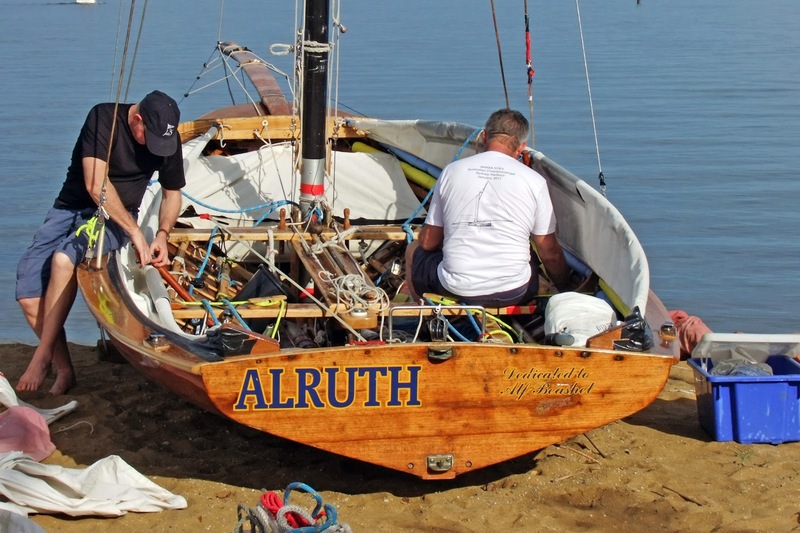 These dinghies do sport big rigs and a jib that hangs off a bowsprit, both are hallmarks of vintage Australian dinghies. 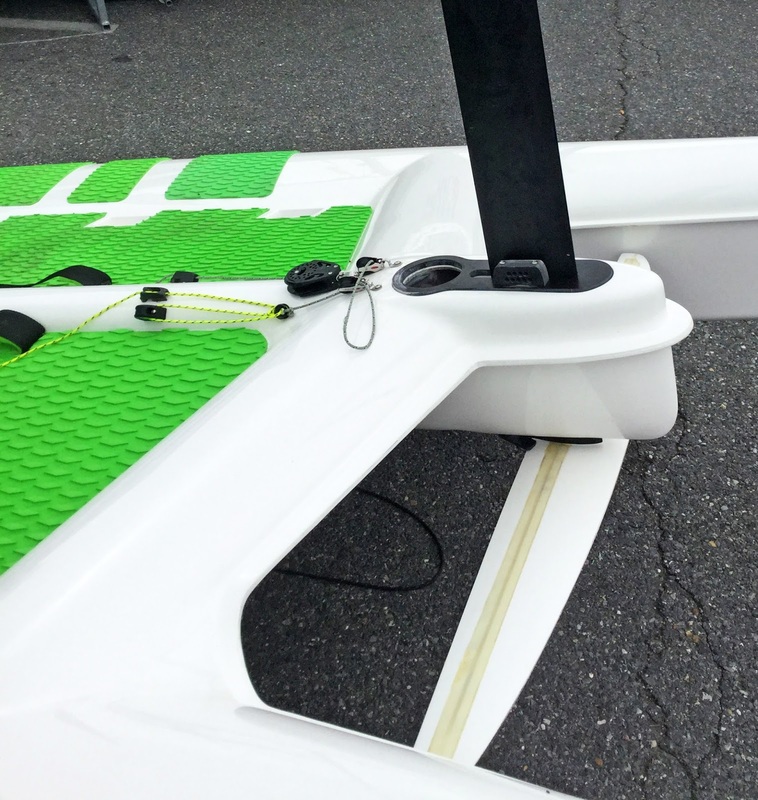 Speaking of Steve Clark; he and his son David have been developing an easy-to-use foiler, the UFO, which is now in production from David's shop, Fulcrum Speedworks. 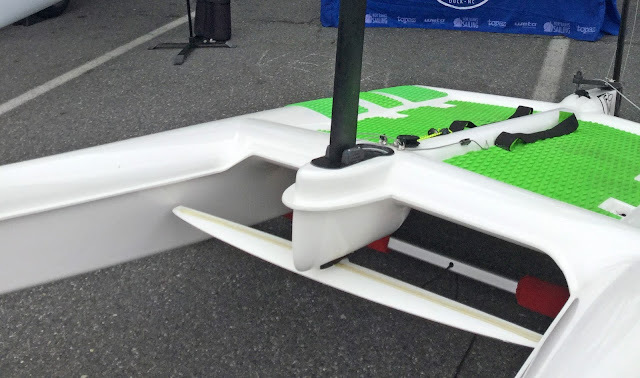 I was able to sneak into the Annapolis Spring Boat Show before it opened back in April and took some quick photos of the UFO. Unfortunately David wasn't around so I didn't have a conversation with him. 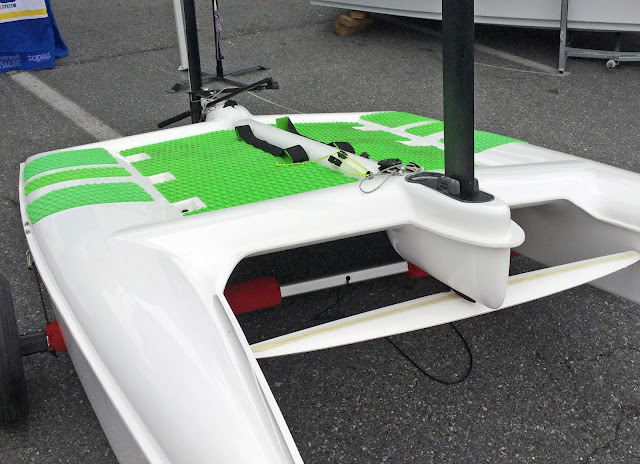 The UFO is a short catamaran configuration. One of the main components of a foiler's performance is the ability to keep everything light; cutting down on the surface area of the platform is one way to cut out weight. 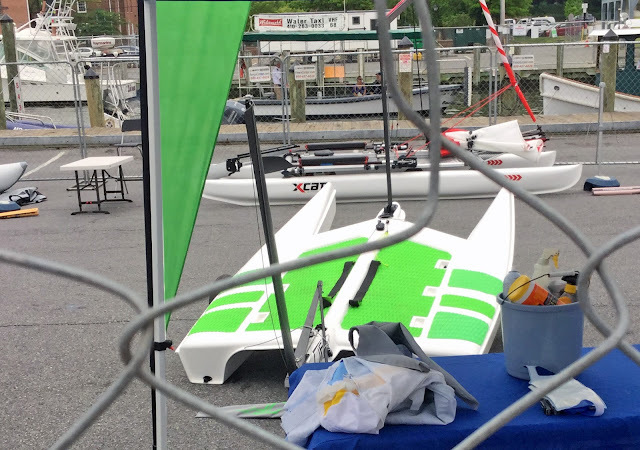 One must remember that the platform has no contribution to speed and exists to keep all the foiling bits, skipper, and rig tied together (and float everything when not foiling). I gather the UFO has a low ride height setting for beginners (so that if you lose it the hulls won't come crashing down from up high) and a higher ride for the experts who want to go faster. Photos from the Internet show a weight tolerant package with several skippers over 90 kg (200 lbs) getting the UFO up and going. I am no foiling expert so it would be best, if you are interested, to scan the Internet for further information. A link to the UFO class website. The main foil retracts between the two hulls so the UFO can be rigged upright, launched upright, and beached upright. 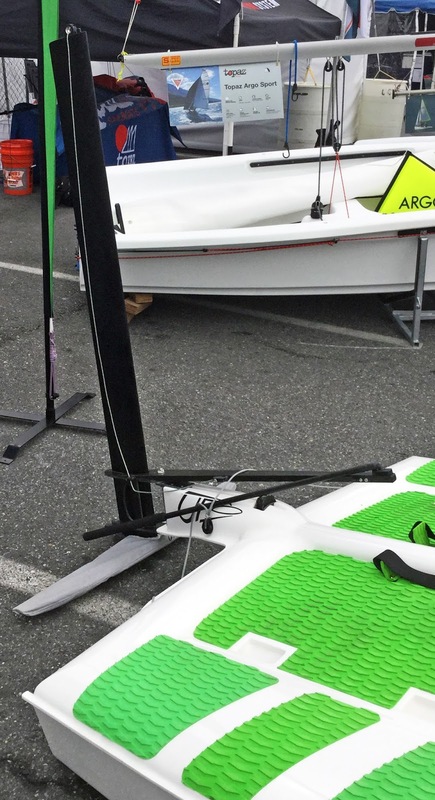 The foils were designed by a French guru attached to Franck Cammas' foiling group. There must be quite a bit of fancy composite engineering going on as both the high load main foil and high load mast step are situated back-to-back just at the front end of the forward beam. Just enough clearance for the main foil to retract between the two hulls. 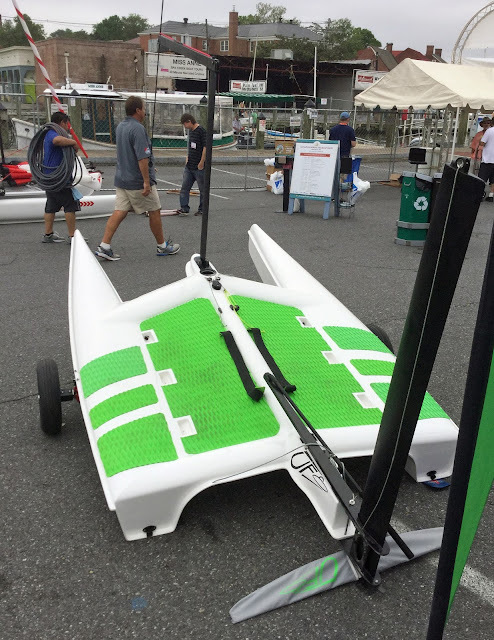 The lime green non-skid gives some contrast to what is basically a white/black package (like most production small boats today). The rudder and rudder foil sit off a short gantry, again another piece that needs to be engineered for cantilevered loading. With this photo through the chain link fence, one can see the flat box hulls in the shape of the stern. The box shape of the hulls allow for the most displacement to be packed into a short length.